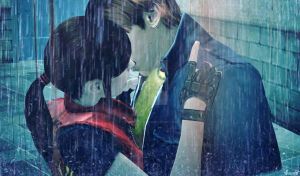 ~ Steve Burnside did actually fall asleep beside Claire Redfield in the plane. A peaceful moment where fantasy became reality, where steve knew it was a dream, but still... he wished to remain asleep... .
Any more requests? Note me! . . . Enjoy! HEY! STEVE! She is my girl! Hands off or die! Wait... you are already dead! YAY!